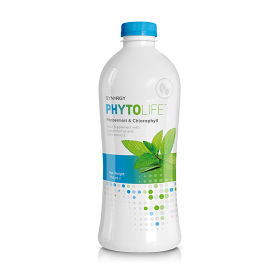 Incorporate Synergy's PhytoLife into your diet by mixing one teaspoon (5ml) with a glass of water, twice daily. Sourced from mulberry leaves and alfalfa, Synergy's PhytoLife is a rich combination of chlorophyllin (sodium copper chlorophyllin) and peppermint oil. With quality in every drop, the peppermint oil found in PhytoLife contributes to normal digestive function and helps turn ordinary water into a great tasting drink that you can enjoy throughout the day. 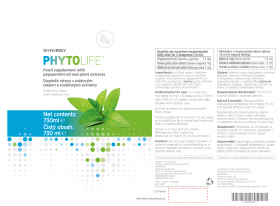 This, along with the fresh taste and liquid form, makes PhytoLife a great companion to your food supplement regime. In 1913, Dr. Richard Willstatter, a German chemist, discovered the functions of chlorophyll. Chlorophyll is a web of carbon, hydrogen, oxygen and nitrogen atoms grouped around a single atom of magnesium. Nature’s green pigment is similar to the web of atoms found in Hemoglobin, the red pigment in blood, except that its centerpiece is a single atom of Iron. In case of pregnancy, breastfeeding or a known medical condition cosult your doctor before use.